When you look past all the volatility-induced “noise,” we believe the fundamental driver of the February stock market correction is a higher level of uncertainty about the path of inflation and interest rates. Inflation is a legitimate concern, because a mistake by the Federal Reserve as a reaction to inflation has the potential to end the current business cycle prematurely. A business cycle downturn would likely coincide with, or be preceded by, a bear market as investors anticipate falling earnings. In trying to understand the forces shaping inflation, we examine the arguments of the “doves,” who primarily emphasize structural disinflationary forces, and the “hawks,” who see the inevitability of inflation as a consequence of excessive government debt and aggressive monetary policy. We conclude that there are cyclical reasons for short- and long-term interest rates to rise further, and yet demonstrate that stocks historically rise along with interest rates until investors anticipate recession. We therefore believe that the current decline in stock prices is just a correction in an ongoing bull market. 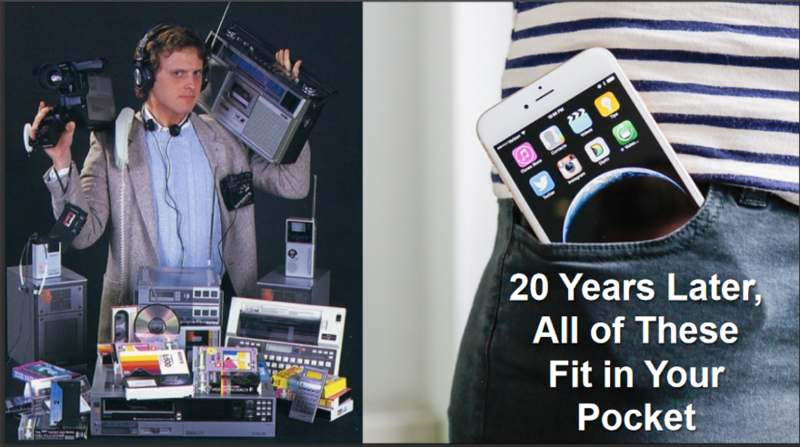 This picture, courtesy of well-known entrepreneur Peter Diamendes who spoke in Richmond last Saturday, summarizes one of the most powerful deflationary forces — technological innovation. It is his opinion that the increases in quality and productivity of today’s cell phones, computers, cars, TVs, etc., are not nearly captured by the official inflation data. This means, according to Peter, that overall inflation is overstated and productivity is understated. The official figures suggest productivity has been lower in the 2000–2018 period relative to the 1990s. This does not reconcile with record profit margins during a slower-than-usual economic recovery. Combine this with a global labor force that still has spare capacity and a consumer who has learned to use the Internet to achieve almost perfect price discovery, and the case for sustained inflation above the Fed’s 2% target seems unlikely. New Fed Chair Jerome Powell is on record last summer (before he was appointed) saying that he doesn’t understand why inflation has not recovered more. His honesty is refreshing, but it increases investor uncertainty. The Fed feels they have a playbook for reducing inflation (the Volker era) but, like so many central banks in developed countries (most notably Japan), central banks have struggled to reignite even moderate inflation. That said, what central bankers want, they tend to get in the end. Low unemployment in the United States, United Kingdom, Japan, Australia, and Canada leaves just southern Europe with spare labor. As small companies become more confident and regulators become more comfortable with bank balance sheets, the velocity of money (the frequency with which it changes hands) should pick up and then the central banks will have to drain money from the system by increasing “real” interest rates, in our view. This is what is happening in the US. Furthermore just as inflation may be overstated in technologically advancing products, there can be no doubting the rise in home prices, land prices, and recently in commodity and import prices. In this environment, a hesitant Federal Reserve might be too slow to respond, thus allowing the inflation “genie,” which has been dormant for a decade, to reappear. Another factor weighing on investor minds is the recent budget deal between the US administration and Congress. Commenting on the recent budget deal, the Committee for a Responsible Federal Budget said: ”No one voting for this bill can claim to care about the debt and deficits – in fact, in its fiscal malpractice, Congress just ordered everything on the menu and then some, and sent the bill over to the kids’ table.” In the absence of a sequestered cap on federal spending, and with few deficit hawks left in Congress from either major party, complacency about the ability to run and finance deficits seem to have hit a new high, in our view. Within RiverFront the debate over inflation is healthy, quite intense, and somewhat intergenerational. The boomers lived through the inflation of the 1970s and see the complacency among policymakers and markets today about inflation risks. The Gen Xers are divided, and the millennials are the least worried about inflation, focusing on how technology companies like Amazon are lowering prices, just as Walmart did a generation ago. In our 2018 Outlook: Tug of War, we highlighted the increase in volatility that we expected as the Federal Reserve continues to raise short-term interest rates, especially as they are no longer a net buyer of bonds. An escalation in global protectionism is the scenario in which we would worry most about a secular (multi-year) rise in inflation, but we give this a probability of around 30%. This is because we believe the expansion of global trade has fostered innovation and disinflation. We believe the global synchronized recovery that became re-energized in mid-2016 has many more years to go. We believe global interest rates have bottomed and are going to rise; however, in past cycles when long-term interest rates rise in response to faster growth, we’ve observed that bull markets have continued. 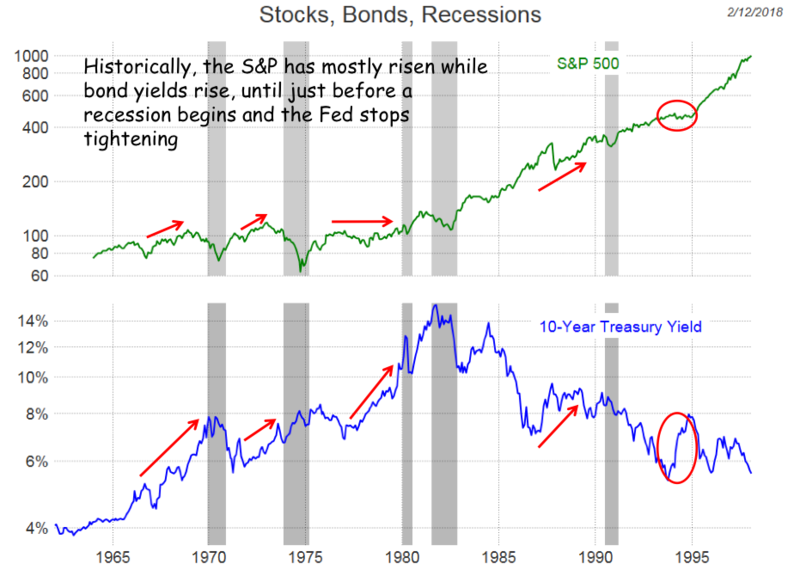 In our charts below, we look at all the business cycles of the last 50 years and show, via arrows, the periods during which rising long-term interest rates coincided with rising or flat stock prices. We think this supports our current strategically bullish stance on stocks.